The shoulder pain and tightness seems to be fading into the rear-view mirror! Amazing. Thank you for your expert help with this. I really appreciate your care, concern and professionalism. Pain is a real pain, and your work made a big improvement in my life. I will give a call if things turn backward, but this has been about 6 weeks of progress with no backsliding. I just wanted to say thanks again for all your help with my recovery. I was feeling pretty rotten when I first came back last winter – in pain but also frustrated and demoralized. The fact that I feel so much better is due in large part to your efforts, whether you were cajoling my arm into positions it couldn’t manage on its own, helping me get stronger, or just making me laugh. Not a lot of people make their work about helping others be healthy and feel better; even fewer are as good at it as you are. I have enjoyed working with Steve Mann following my shoulder and rotator cuff surgery in early July. Steve’s professionalism. knowledge, kindness, enthusiasm, and encouragement, as well as his sense of humor, made the five month process a pleasure, and I shall miss him and our sessions. I also appreciate your cheerful treatment facility and helpful Kylie. My Friend, a former patient of yours, who had the same surgery. had been enthusiastic in her praise of BE Fit, and I shall certainly recommend BE Fit, and Steven in particular, to my friends. I am very grateful to be functioning well again and without pain. Thank you! I was having horrible shoulder pain that increased at night and I couldn’t sleep. I wasn’t sure where to turn. I called BE Fit, explained my issue and was able get in right away. They explained my prognosis, helped me get my orthopedic workup fast-tracked, and provided immediate help to reduce my pain and get me sleeping better. Although I am not looking forward to surgery, I know that BE Fit will be there to help me, and I look forward to continuing my rehab with them. I began therapy with David because I had adhesive capsulitis (of the shoulder). I was in constant pain and had little mobility. David developed a treatment plan that helped me to begin to heal and regain mobility. I was able to use the exercises he suggested at home and I now have full mobility with no pain. Thanks David! I am happy to write on behalf of my experience at BE Fit, and you can feel free to pass my thoughts on to future prospective clients. In December of 2010, I had ACL surgery on my left knee for a sports-related injury. As I’m a collegiate athlete, I was very concerned with making it back for my season in August, and eager to have the best possible help and guidance in doing so. BE Fit turned out to be a perfect fit for me, and my work with Dave was a very important part of my recovery. My first appointment at BE Fit was just one day after my surgery, and from that point forward I knew I was in good hands there – Dave clearly was very experienced and eager to help me meet my goals. Not only did Dave demonstrate a considerable level of expertise and knowledge, but he also helped talk me through some of the emotions associated with the recovery. When I returned to college for the spring semester, the staff at BE Fit helped me coordinate the transition to a new PT effortlessly. Whenever I had a major decision to make, I’d e-mail Dave to be sure he was on board – and whenever I came home I chose to stop in at BE Fit to get Dave’s opinion on my progress. My senior season turned out to be my most successful of my four years playing college soccer, and I captained my team to the conference finals, starting fifteen games a long the way. After the season I immediately e-mailed BE Fit to thank Dave because I truly couldn’t have done it without the support and knowledge that BE Fit gave me throughout my recovery. I’d recommend it without reservation to any future PT client. I came to BE Fit with a knee injury from a skiing accident. David took time to understand and explain what he thought was happening with my joint. He not only prescribed a physical therapy regime, but he explained how the exercises could help me recover. Now I’m back on my feet and looking forward to an advanced mountaineering course followed by an attempt to summit Mount Hood in Oregon! After having multiple knee surgeries, I was not eager to have another round of PT after my last knee replacement revision. I thought, oh no, same old, same old, so I decided to try BE Fit for my recovery. David was relaxed and soon we were almost enjoying the push and shove, bend and straighten, lift and hold, and the myriad of exercises that follow joint surgery, BE Fit is friendly, parking accessible,( a big plus), and offers a calm atmosphere. Aside from being a local lad, David brings a wealth of experience to the job, As they say, Buy Local…. buy BE Fit! I worked with David to help eliminate knee pain. He’s worked with me in the clinic and has given me exercises to follow up with at home. David takes the time to discuss my concern with me. He works on different techniques during my clinic visits, and he gives sound advice. I appreciate that scheduling is flexible. I was experiencing sleep interrupted by hip and shoulder pain, I could not bend to reach things on the floor, and I was generally uncomfortable, unable to exercise and moving about gingerly, I could not swim for even a short period of time without pain in my hip or shoulder. I made a phone call to BE Fit. To my surprise and pleasure, I was scheduled that day, after my first visit with Lois my pain level was half what it was when I arrived at BE Fit. They were respectful of my pain but taught (me) certain exercises, stretches and orderly procedures that on my own, I could use to control the pain. Now I am swimming and sleeping pain free. As an additional, seemingly small, but helpful and comforting piece of my experience with BEfit is that the administration of my claim and my appointments were smooth and without additional effort on my part. I went to BE Fit seeking improved mobility following a hip resurfacing operation. I had worked with two other physical therapists after the operation, and had many sessions of deep tissue massage as well, over the course of two years. Though the operation itself seems to have gone well, my mobility in general and stride in particular were limited and seemed to have plateaued. David got to the heart of the problem quickly and was extremely helpful in explaining what was going on and at providing therapy that I was able to comply with. I’m walking farther and faster than I have in several years, without pain. Plus, I made an overnight round trip to Westchester a couple of weeks ago and was pleased to realize that I had driven 4 hours each way in comfort. I brought my 13 year old son to BE Fit for a consultation because he was experiencing hip pain while playing youth soccer. BE Fit was able to listen to my description of his problem and then direct me to the appropriate services. I was unsure where to start. Over the phone I learned that because my son plays for Lighting Soccer he is eligible for a free consultation. I was able to get an appointment for the very next day, which I appreciated as each practice seemed to be getting worse for him. One of the therapists evaluated him and prescribed a series of stretching and strengthening exercises. We did and are still doing these exercises and the hip flexor pain has stopped. My son is now off and running (and kicking) for his spring soccer season. “I did it! I took it really slow and just enjoyed a very long tour of the city. I finished in 3:53 (just under a 9 minute mile pace- most were about 8:40 but I took the uphills and downhills very slow). My slowest marathon in about 3 years but it happened and my body feels pretty good. The knee held up and hasn’t hurt since finishing! Those of you who have ever run a marathon will know that there is a significant training period with several weeks of progressively longer runs. This can be daunting at times even for the experienced runner, and even more so when dealing with an injury. 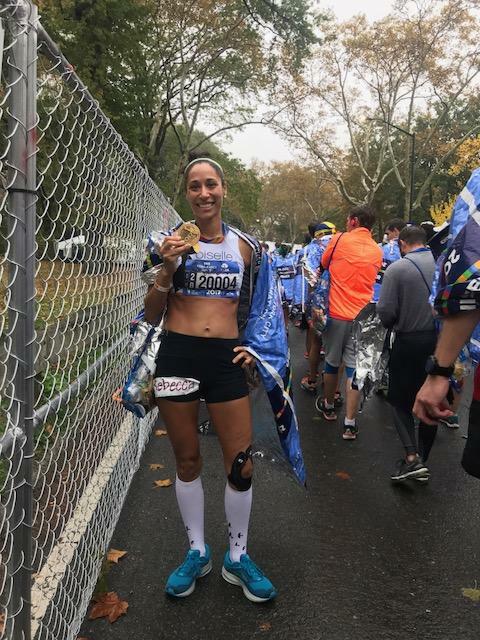 Rebecca was still 6 weeks away from running the NYC Marathon when she came to BE Fit. See Rebecca Standfield-McCown’s story here. Thanks Eric! Last weekend was the best race in three years! Feeling better and better each week. Hopefully can keep that trajectory going. Really appreciate having you there when I need this (getting) older body realigned/tuned up! Thanks for everything these past few weeks! I’m so psyched to be running pain free again and I think the shoulder work we talked about yesterday will really help. You’ll be the first person I call if something comes up down the road! Thanks so much. I played a full court game (with brace) for the first time last night, and it felt great. Thanks for your expert guidance on my recovery. I will be in touch if problems recur. Being middle aged and athletic, I suspect I will need to see you again for some future ailment, and hopefully recover as well. I just wanted to send a thank you for all your help over the past few months. Last night I ran a personal best of 9:28 in the 3k and broke the school record! I couldn’t have done it without your help! Thank you for everything! When I get my knee redone (after 23 years), I will be doing rehab with you because I have had two shoulder injuries that you helped me work through. And recently, you helped me get through my achilles tendonitis as well as a calf issue to prepare to run the NYC marathon. I like how you understand the need to get back in there, but you know when it is time to back off. You are tuned into the subtlety of injuries. You pushed hard with very specific treatments and training to get me towards my goal, but you know when rest needed to happen before we stepped forward. I ran the marathon pain-free after thinking I would have to drop out 3.5 months before the race. The positive atmosphere at BE Fit is great. The staff clearly works well together. And you have a lot of knowledge and experience. I would not consider any other place to do rehab in the entire Upper Valley. It’s been quite an informative journey, and I was lucky to have such a talented and knowledgeable physical therapist. I’ll definitely sing your praises and refers others your way. You guys are great! I miss you guys – sometimes I think I should go and fall off a ladder or something so I can come back in and see you! My experiences at BE Fit Physical Therapy have been very satisfactory. Each time, I have had Dave Barlow as my therapist; my injury improved and was healed within the time frame explained to me. BE Fit has a pleasant environment: everyone is very friendly and helpful, the area is neat and clean, and office staff, and therapists knowledgeable and helpful. It is also a place where one can relax while doing difficult and sometimes stressful exercise work. In short, if one has to undergo physical therapy for an injury, this is the place to go and smile while you work hard.